The Government is focusing attention on the standards of sanitation facilities in schools. Education Minister Bandula Gunawardena said that nearly 1,300 schools in the country do not have proper and healthy sanitation facilities, and stressed the need to provide such facilities in the future. He said improving the health conditions of over 4.2 million school children is an urgent need, considering the various diseases spreading among children due to lack of proper sanitation in schools. Minister Gunawardena is of the view that many schools in the urban and distant rural areas have no adequate sanitation facilities such as toilets and washing rooms. The Education Department will also deploy a team of investigating officers to visit schools and inspect the state of sanitation facilities. Referring to an International Conference to be held from April 4-8 in Colombo under the theme "The importance of improving sanitation in South Asian countries",theMinister Gunawardena told the Junior Observer over 1,300 schools out of 9,500 public schools in the country, did not have adequate sanitation facilities. He said it is the duty of school authorities to provide adequate sanitation facilities, considering the number of children in their respective schools. The Minister said in some schools, with even less than 1000 students have only five toilets and asked principals in such schools and also area education officials to provide adequate toilets.He said in addition, school authorities should also keep a close tab on the cleanliness of such places regularly, as it will also help to stop the spread of waterborne diseases. 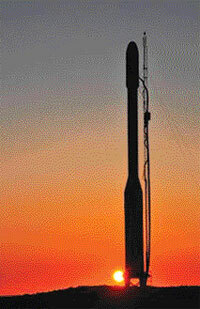 A rocket carrying an Earth-observation satellite has blasted off.Vandenberg Air Force Base officials say the Taurus XL rocket carrying NASA's Glory satellite lifted off at 2:09 a.m. PST Friday March 4, from the base.Glory is on a three-year mission to analyze how airborne particles affect Earth's climate. Besides monitoring particles in the atmosphere, it will also track solar radiation to determine the sun's effect on climate change. The 424 USmillion dollar mission is managed by the NASA's Goddard Space Flight Center in Maryland. The statue representing Oetzi the Iceman at the Bolzano Museum. Results from tests decoding the DNA of Oetzi the Iceman discovered two decades ago on September 19, 1991 will be released by scientists next month. The mummy which was found in Schnal Valley glazier on the Oetztal Alps in South Tyrol, northern Italy was affectionately nick named Oetzi after the area. He was about 1.60 metres (5 ft. 3 inches) in height and weighed 50 kg (110 pounds) which was considered above average for his time, by researchers. He would have had to wear size 38 shoes had he lived today. Recent research has revealed that the famous Iceman did not have blue eyes as previously believed so, now, Dutch experts Alfons and Adrie Kennis have created a new model of Oetzi to be displayed at the South Tyrol Museum of Archaeology in Bolzano. Based on the three-dimensional images of the mummy's skeleton as well as the latest forensic technology, the new Oetzi will sport brown eyes. 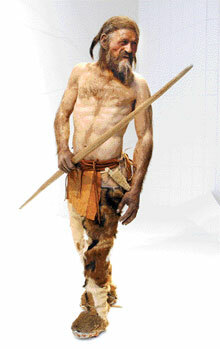 The new Oetzi model which went on display on March 1 will remain at the Bolzano Museum until January 15, 2012. Oetzi the Iceman, fast approaching the age of 5,300 years is believed to have died at the age of 45. Sri Lanka has commenced a special research project on the environmental impact on the Mannar Sea due to over-exploitation following the end of terrorism. The research is conducted by the Universities of Jaffna and Ruhuna along with a foreign university. The sea is exposed to mass exploitation by the local fishermen and Indian poachers causing heavy damage to the unique maritime environment in the sea. The researchers are to focus on the impact on the traditional fisher communities due to the new situation. The project report is to be handed over to the Ministry of Fisheries and Aquatic Resources soon. Wildlife Department has decided to appoint a special unit to take measures to minimise the human-elephant conflict in villages. A large number of wild elephants has been killed by villagers in the recent past mounting pressure on the Government to act before the situation worsens to the level of near extinct of this massive mammal. The Director General of the Wildlife Department said that the Unit consisting of 25 officials would be established under the Department. The Unit will coordinate with the police, divisional secretariat, and agrarian organisations, to take preventive measures based on the complaints. The Director General of the Wildlife Department said that the Unit will be provided with a hotline soon to accept complaints pertaining to human-elephant conflicts. The special unit will operate with the 13 elephant control units already set up in the wildlife zones of the country. The special projects unit of the Central Environmental Authority (CEA) is building a data base on the environmental information of Sri Lanka. The environmental data base will be made available in compact discs and the Gampaha district CD has already been released. The environmental databases of Monaragala, Badulla and Hambantota districts have already been completed, said the Chairman of the Central Environmental Authority. The Chairman said that the database would be useful for environmental planning, management and evaluation. The Central Environmental Authority has planned to complete the databases for all the districts of the island this year. The CEA is using the Data from the Statistics, Surveyor, Wildlife, Forest, and Archaeological Departments are being used by the CEA to build these databases.